A leading Japanese artist has been told to return a major prize after it was revealed he had copied several works painted by an Italian artist. Yoshihiko Wada initially denied he had plagiarised the work of Italian artist Alberto Sughi, saying the two artists had painted "in collaboration". Now he has agreed to return the prize he was awarded by Japan's government. It is the first time that has happened since the scheme was set up to reward artists more than half a century ago. Yoshihiko Wada, as one of Japan's leading artists, became even more famous when he received the major prize in March. Soon after, though, officials received an anonymous tip-off that questioned the authenticity of Wada's work. 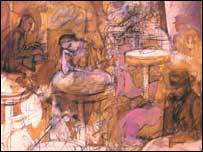 Several of his paintings, it was said, were similar in colour and composition to those of Alberto Sughi. The Japanese sent investigators to Rome. Wada claimed the two artists inspired each other and had drawn together. But Sughi told a very different story. He said the Japanese man had come to his studio five times and photographed his work from different angles. He had thought he was a fan, not a painter. Wada is still somewhat reluctant to admit that what he did was really wrong. "I borrow others' compositions and add my own ideas," he insisted. "Only artists who've studied abroad can understand the subtle differences in nuance." The Japanese government disagrees - Wada, it says, must give the prize back.